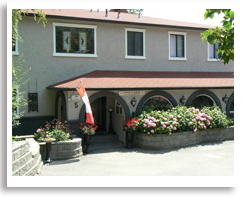 A Touch of English Bed and Breakfast Accommodation is located in a peaceful neighborhood in beautiful Kelowna, in the heart of the Okanagan Valley, in British Columbia, Canada. 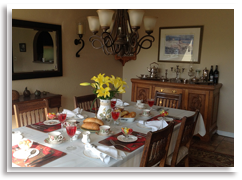 Our luxury B&B home is nestled in a landscaped yard with fragrant gardens. 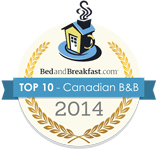 Fine Okanagan Bed and Breakfast accommodation, indeed! A Touch of English is an ongoing ‘tradition’ you might say. 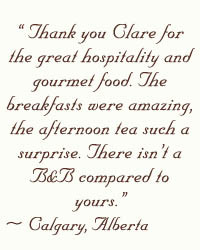 Clare & Kelly, your gracious hosts, have been pampering B&B guests for the past 22 years. We can offer you three luxury rooms, as well as 2 additional suite, with separate access, kitchen and living room, for your get-away vacation. 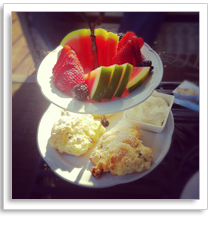 A Touch of English Bed & Breakfast originally started in North Vancouver. 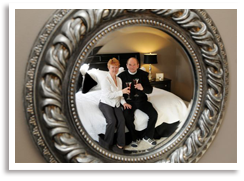 Now, after having fallen in love with the beautifully scenic Okanagan Valley and the wonderful, easy-paced life style in Kelowna, Clare and Kelly are thrilled to welcome you to their lovely new Okanagan bed and breakfast. Your hosts have perfected their charming British hospitality and now offer comfortably luxurious accommodations in the heart of the Okanagan Valley, in British Columbia, Canada. A winning combination! Clare, originally from Newbury, Berkshire is quick to keep you chuckling with her easy humour, and will tantalize you at every turn with her culinary prowess. Oh the food! Afternoon tea with warm-from-the-oven scones that taste like heaven, or perhaps a glazed apple and amaretto omelet for breakfast. Hospitality taken to new levels. Just for you!